National Catholic Schools Week is the annual celebration of Catholic education in the United States. It starts the last Sunday in January and runs all week, which in 2019 is January 27 – February 2. The theme for the National Catholic Schools Week is “Catholic Schools: Learn. Serve. Lead. Succeed.” This theme is planned to be used until at least the year 2020. Schools typically observe the annual celebration week with Masses, open houses and other activities for students, families, parishioners and community members. Through these events, schools focus on the value Catholic education through the teachings of Jesus Christ provide to young people and its contributions to our church, our communities and our nation. What do our schools have planned for Catholic Schools Week? MONDAY: Celebrating Your Community; learning to serve others in their local community. 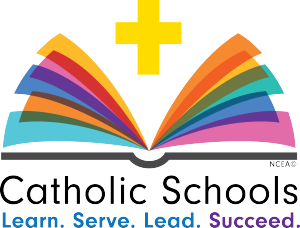 TUESDAY: Celebrating Your Students; celebrating the significant contributions Catholic schools make to the nation. WEDNESDAY: Celebrating the Nation; our students, families, educators and other Catholic school supporters communicate the value of Catholic education to government leaders. THURSDAY: Celebrating Vocations; preparing children to use their God-given talents to their fullest in their eventual life paths. FRIDAY: Celebrating Faculty, Staff and Volunteers; honoring the teachers and staff that provide service to our schools. SATURDAY: Celebrating Families; Showing appreciation for the partnership our parents provide at the school by instilling in their children values and expectations to be successful. Good News for the Nation: Catholic Schools Are Thriving. Listed below are some national facts and figures about the ongoing excellence and promise of growth represented in our country's Catholic schools. There are over 6,500 Catholic Schools in our country today (18 in our diocese). 99% of our students graduate from high school compared to about 78% of public school children nationwide. Over 95% of our graduates go on to college. Almost 80% of our graduates get into their first choice of college or university. 100% of students at our schools participate in some kind of service learning opportunity while in school. Catholic School graduates are more likely to attend Mass, be married in the church, and have their children baptized then those parishioners who do not graduate from Catholic Schools.